MASON, William Ernest, (father of Winnifred Sprague Mason Huck), a Representative and a Senator from Illinois; born in Franklinville, Cattaragus County, N.Y., July 7, 1850; moved with his parents to Bentonsport, Van Buren County, Iowa, in 1858; attended the Bentonsport Academy and Birmingham College 1863-1865; taught school in Bentonsport 1866-1868, and in Des Moines, Iowa, 1868-1870; studied law; moved to Chicago, Ill., in 1872; admitted to the bar and commenced practice; member, State house of representatives 1879; member, State senate 1882-1885; elected as a Republican to the Fiftieth and Fifty-first Congresses (March 4, 1887-March 3, 1891); unsuccessful candidate for reelection in 1890 to the Fifty-second Congress; resumed the practice of law in Chicago; elected to the United States Senate as a Republican and served from March 4, 1897, to March 3, 1903; chairman, Committee on Manufactures (Fifty-fifth and Fifty-sixth Congresses), Committee on Post Office and Post Roads (Fifty-seventh Congress); again resumed the practice of law in Chicago; elected to the Sixty-fifth, Sixty-sixth, and Sixty-seventh Congresses and served from March 4, 1917, until his death in Washington, D.C., on June 16, 1921; interment in Oakwood Cemetery, Waukegan, Ill.
Papers: 1898, 1902. 2 letters. Papers: 2 letters (June 27, 1892; November 28, 1894) in Post family papers, 1857-1895; and 1 letter (November 16, 1899) in Seymour autograph collection, 1750-1945. Papers: No date. 1 letter. Mason, William E. John the Unafraid. 5th ed. Chicago: A.C. McClurg & Co., 1913. U.S. Congress. House. 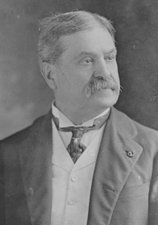 William E. Mason. Memorial Addresses Delivered in the House of Representatives of the United States in Memory of William E. Mason, Late a Representative from Illinois. 67th Cong., 2d sess., 1921-1922. Washington: Government Printing Office, 1924.